Machine learning has been around for decades, but the advent of big data and more powerful computers has increased its impact significantly — ­moving machine learning beyond pattern recognition and natural language processing into a broad array of scientific disciplines. A subcategory of artificial intelligence, machine learning deals with the construction of algorithms that enable computers to learn from and react to data rather than following explicitly programmed instructions. “Machine-learning algorithms build a model based on inputs and then use that model to make other hypotheses, predictions, or decisions,” explained Irfan Essa, professor and associate dean in Georgia Tech’s College of Computing who also directs the Institute’s Center for Machine Learning. A short write-up on one of my recent publications. A new login authentication approach could improve the security of current biometric techniques that rely on video or images of users’ faces. Known as Real-Time Captcha, the technique uses a unique challenge that’s easy for humans — but difficult for attackers who may be using machine learning and image generation software to spoof legitimate users. The Real-Time Captcha requires users to look into their mobile phone’s built-in camera while answering a randomly-selected question that appears within a Captcha on the screens of the devices. The response must be given within a limited period of time that’s too short for artificial intelligence or machine learning programs to respond. The Captcha would supplement image- and audio-based authentication techniques that can be spoofed by attackers who may be able to find and modify images, video and audio of users — or steal them from mobile devices. CITATION: Erkam Uzun, Simon Pak Ho Chung, Irfan Essa and Wenke Lee, “rtCaptcha: A Real-Time CAPTCHA Based Liveness Detection System,” (Network and Distributed Systems Security (NDSS) Symposium 2018). A TEDx talk that I recently did. assessment of OSATS based surgical skills and provide an analysis of different features on multi-modal data (video and accelerometer data). proposed features are compared to existing methods of Sequential Motion Texture (SMT), Discrete Cosine Transform (DCT) and Discrete Fourier Transform (DFT), for surgical skills assessment. Results: We report average performance of different features across all applicable OSATS criteria for suturing and knot tying tasks. Our analysis shows that the proposed entropy based features out-perform previous state-of-the-art methods using video data. For accelerometer data, our method performs better for suturing only. We also show that fusion of video and acceleration features can improve overall performance with the proposed entropy features achieving highest accuracy. Conclusions: Automated surgical skills assessment can be achieved with high accuracy using the proposed entropy features. Such a system can significantly improve the efficiency of surgical training in medical schools and teaching hospitals. Presented at The 8th International Conference on Information Processing in Computer-Assisted Interventions, in Barcelona, SPAIN, June 20-21, 2017. Aneeq Zia awarded the “Young Investigator Travel Award” given to young investigators (including Ph.D. and MSc students and junior researchers) with accepted papers at IPCAI conference to attend IPCAI/CARS 2017. 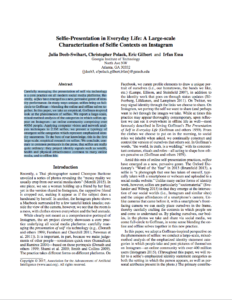 This paper was also 1 of the 12 papers voted by the audience for a 25 minute long oral presentation and discussion session on the last day of conference (based on 5 minute short presentations given by all authors on the first day). sentiment-specific attributes. We map the top predicted attributes to sentiments and extract the dominant emotion associated with a picture of a social event. Unlike recent approaches, our method generalizes to a variety of social events and even to unseen events, which are not available at training time. 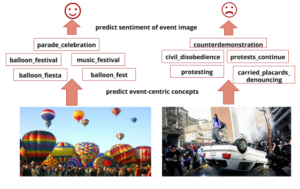 We demonstrate the effectiveness of our approach on a challenging social event image dataset and our method outperforms state-of-the-art approaches for classifying complex event images into sentiments. We propose to leverage concept-level representations for complex event recognition in photographs given limited training examples. 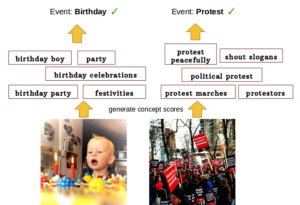 We introduce a novel framework to discover event concept attributes from the web and use that to extract semantic features from images and classify them into social event categories with few training examples. Discovered concepts include a variety of objects, scenes, actions and event subtypes, leading to a discriminative and compact representation for event images. Web images are obtained for each discovered event concept and we use (pre-trained) CNN features to train concept classifiers. Extensive experiments on challenging event datasets demonstrate that our proposed method outperforms several baselines using deep CNN features directly in classifying images into events with limited training examples. We also demonstrate that our method achieves the best overall accuracy on a data set with unseen event categories using a single training example. Presented at IEEE and PAMITC’s Winter Conference on Applications of Computer Vision, March 27-30, 2017, in Santa Rosa, CA, USA. The Interdisciplinary Research Center (IRC) for Machine Learning at Georgia Tech (ML@GT) was established in Summer 2016 to foster research and academic activities in and around the discipline of Machine Learning. This center aims to create a community that leverages true cross-disciplinarity across all units on campus, establishes a home for the thought leaders in the area of Machine Learning, and creates programs to train the next generation of pioneers. In this talk, I will introduce the center, describe how we got here, attempt to outline the goals of this center and lay out it’s foundational, application, and educational thrusts. The primary purpose of this talk is to solicit feedback about these technical thrusts, which will be the areas we hope to focus on in the upcoming years. I will also describe, in brief, the new Ph.D. program that has been proposed and is pending approval. We will discuss upcoming events and plans for the future. Visualization of some of the training videos. Understanding surgical workflow has been a key concern of the medical research community. One of the main advantages of surgical workflow detection is real-time operating room (OR) scheduling. For hospitals, each minute of OR time is important in order to reduce cost and increase patient throughput. Traditional approaches in this field generally tackle the video analysis using hand-crafted video features to facilitate the tool detection. Recently, Twinanda et al. presented a CNN architecture ’EndoNet’ which outperformed previous methods for both surgical tool detection and surgical phase detection. 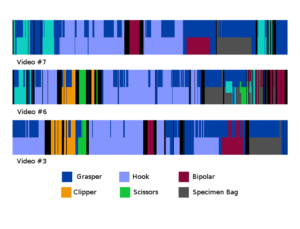 Given the recent success of these networks, we present a study of various architectures coupled with a submission to the M2CAI Surgical Tool Detection challenge. We achieved a top-3 result for the M2CAI competition with a mAP of 37.6. This entry was ranked 3rd n the M2CAI Surgical Tool Detection challenge. The massive growth of sports videos has resulted in a need for automatic generation of sports highlights that are comparable in quality to the hand-edited highlights produced by broadcasters such as ESPN. Unlike previous works that mostly use audio-visual cues derived from the video, we propose an approach that additionally leverages contextual cues derived from the environment that the game is being played in. The contextual cues provide information about the excitement levels in the game, which can be ranked and selected to automatically produce high-quality basketball highlights. We introduce a new dataset of 25 NCAA games along with their play-by-play stats and the ground-truth excitement data for each basket. We explore the informativeness of five different cues derived from the video and from the environment through user studies. Our experiments show that for our study participants, the highlights produced by our system are comparable to the ones produced by ESPN for the same games.